Ice cream cakes, like graham crackers and puff pastry, are not something that most people thing about making. They’re something that most people think about buying, and when they do run down to the local ice cream shop (whether it’s a chain, a grocery store or a familly-owned place), they’re buying the cakes for the look of the overall dessert and the taste of the ice cream, not of the cake. 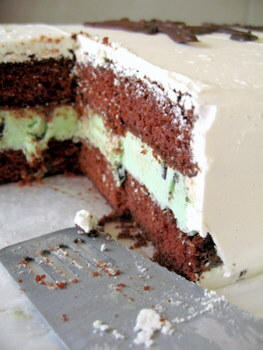 Ice cream cakes – like the one I made pictured above (recipe here!) – are really quite easy to make at home and, while they do take a bit longer than a regular layer cake in terms of lead time, they are not difficult at all to put together. The best way I’ve found to make an ice cream cake is to choose your pan size (the same as the cake) and, the day before you want to assemble/bake the cake, line it with plastic wrap. 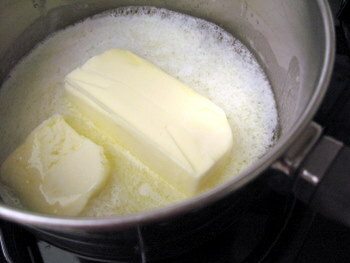 Soften some ice cream and spread it into the prepared pan, then freeze until the ice cream is firm. The plastic wrap can then be removed from the pan and the ice cream layer can be wrapped and stored in the freezer while you bake the cake. When it comes time to assemble, just place the frozen ice cream layer between you cake layers and proceed to frost as normal. Just don’t forget to save room in the freezer for the finished cake, because this isn’t the kind of dessert that you can stick in an airtight container and leave on the counter! And I say that to myself.. it’s so simple, and yet I never could figure out (not that I’ve tried, perhaps in idle wonderment) how you would go about making one! Now i wanna make one! Hmmm that ice cream maker is begging to be used too…. To think that I’ve always struggled to spread that darn ice cream into a spring pan!!!! Do you have any suggestions on frosting? I’ve heard that some icing can get..ummm..interesting when frozen. My son just declared that he wants ice cream cake for his birthday, so this is very helpful! I’ve read that 7 min. frosting is good on ice cream cake, but what can you use if you want to decorate it say, like a silly monster? I have been thinking of making a cake like this fovever, Nic – tks for your tips! our local news station used to have a cooking segment on friday evenings and they would have local chef and bakers come demonstrate a recipe. years ago, one guy demonstrated how to make an ice cream cake like they do (they being whatever restaurant/bakery he was from). they would bake a cake (like one box of mix worth) and let it cool. then they would break off large pieces and press it into the bottom of a spring form pan until the whole cake was used up and it was fairly level. they would freeze that for a bit, then add some slightly softened ice cream on top. freeze until hardened. then they’d take it out and frost as necessary. he commented that pressing the cake into the pan was what gave the cake a good dense and moist feel to it. i have never tried it (sad to say) but i wanted to offer a slightly different version for folks to try 🙂 love your site, btw! Yummy, I like this cake :). I had one of these for my 8th birthday, which was a VERY long time ago. I made ice cream cupcakes a few weeks ago, they were yummy but making them was definitely a messy process :). I like how perfect your ice cream looks, it didn’t melt, unlike the ice cream on my cupcakes :P! just ask what i must to know if i want to make my own ice cream cake store. i know this post was years ago, but just ran across it on google. thank you for this awesome tip – i’ll be making my mom’s birthday cake this weekend + this will REALLY help!